Cleaning your Mac is so important for its performance, you know. From system junk to trash bins, everything can possibly slow down your macOS system. That was why we recommended a tool like CleanMyMac X when covering the best Mac cleaner software. And, we haven’t changed our opinion on that matter. MacPaw, the developer behind CleanMyMac X, has added some new features into the tool now, though. In the huge list of updates, however, we found something so impressive — Space Lens. It has been designed to help you clean up unwanted files from your Mac, but it’s different from other tools for the same purpose. In this article, we will be talking more about Space Lens and how you can use Space Lens in CleanMyMac X to remove unwanted files from your Mac. Before we get into the how-to part, let’s have a good look at what Space Lens can offer. Shall we? Space Lens is an all-new CleanMyMac X module that works as disk storage analyzer and optimizer. It means you can analyze your macOS disk and understand the files taking up space. In other words, CleanMyMac X Space Lens is your answer to the question — where have all my storage space gone? 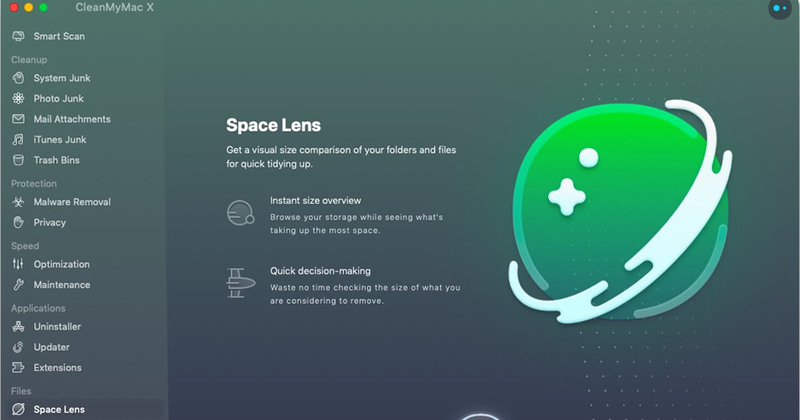 Simply put, Space Lens will help you see and clear out unwanted files taking up precious disk space. How does Space Lens work? Space Lens in CleanMyMac X works the same way every other disk analyzer works. It will analyze your Mac disk completely, find out which folders are taking up space and show you the respective information. In case you are wondering what’s different — it’s the UI. The biggest problem with disk analyzers is that they get really clumsy at times. They may have a GUI but it is difficult to know which apps are taking up storage space. CleanMyMac X makes all the difference here. The tool displays all the important information through an intuitive User Interface. In a single look, you can know which part of your computer is taking up all the space. Thereafter, you will be able to navigate and remove all the files. On any day, CleanMyMac X Space Lens is better than in-built macOS disk analyzer. Yeah, you guessed that reason behind the name. CleanMyMac X Space Lens lets you zoom into the disk and space. Awesome, huh? Do you love extra storage space on your Mac? If yes, Space Lens is super-useful on any day. If you do already have CleanMyMac X installed on your Mac, it’s like a cherry on the cake, though. You can update the program to get the brand-new feature. We also found that the Space Lens feature helps in quick decision making. Because it represents all data via Graphical Interface, you can easily decide whether you want to keep a particular file on the device. It makes everything easier. How to use Space Lens to remove unwanted files? Now that you are well-informed about the Space Lens feature, shall we check out the steps? You have to update your CleanMyMac X to the latest version. If you are using Setapp, it will be automatically updated. In that case, you can simply open the CleanMyMac X app from Launchpad. Once you have opened the tool, go to the bottom part of the sidebar and choose Space Lens from the sub-section Files. Now, you can see the introductory screen of Space Lens feature in CleanMyMac X. As it says, the feature will offer instant size overview and quick decision-making. In order to proceed, you can click on the Grant Access button. It means CleanMyMac X needs full access to the file system. To enable Full System Access, you have to go to System Preferences -> Security & Privacy -> Privacy tab and choose Full Disk Access section. You won’t probably see any option out there. So, to add CleanMyMac X to the section, you have to provide the system password. Click on the lock and provide the password. Once you are done, click on the + button and choose CleanMyMac X from the Applications folder. That’s it, it’s ready to roll. Once you are back in the CleanMyMac X Space Lens interface, click on the Scan button. In this step, CleanMyMac X would be building the storage map of your Mac. It means the software would try to understand where you have placed your files and how much they weigh. Wait for some time until CleanMyMac X finishes the scanning process. This may take up to a few minutes as per your storage space. In my MacBook Air, the process was done in a few seconds. Now, you can see the fully-fledged interface of the storage space analyzer in CleanMyMac X Space Lens. As you can see below, the screen is split into two sections. On the left side, there is a traditional list of directories, along with the size and number of items. On the right side, CleanMyMac X shows a bubble-like cloud of directories. The size of the individual cloud depends on the size. It means the largest folder would be the biggest bubble. This step is easy. You can navigate through the whole file system by clicking on the folders. The folders would open up the sub-folders and you can go on until you find the final file. If you want the traditional form of navigation, you can use the pane on the left as well. Now, after you have found the most weighing files/folders, you can easily delete them. Just pick the folders you want to delete using the right-click menu or from the left-side pane. A Remove button would become active at the bottom. Click on the button and CleanMyMac X will start the cleaning process. There is also an option to review the selected files. Note that CleanMyMac X doesn’t remove system files for the safety of your Mac. That’s why some essential items are disabled, and you can’t select them for removal. That’s it. In a second or two, CleanMyMac X Space Lens would finish the file removal process. The whole thing is super-fast and Space Lens would also show you a summary when it’s done. So, that is how you use CleanMyMac X Space Lens to remove unwanted files from your Mac. As you just saw, the process is super-easy and doesn’t take more than a few seconds. But, when compared to other tools for disk analysis, CleanMyMac X does the job very well. And, we would recommend CleanMyMac X all the way more now that it has such a cool feature. I personally loved this feature and is completely secure. The tool understands which files are important for your macOS system and what to remove. Altogether, it’s great that you can now remove everything unwanted from the same space.